Carpet Bright UK has an exceptional reputation as one of the UK’s leading domestic carpet cleaning specialists. Yet, before our involvement, Carpet Bright UK's online presence was not much to behold. We were tasked with increasing the company's revenue through the use of a cost-effective digital marketing strategy. The first step in all of our local digital marketing campaigns is to get to know the ins-and-outs of our client's business, their competition and the industry as a whole. 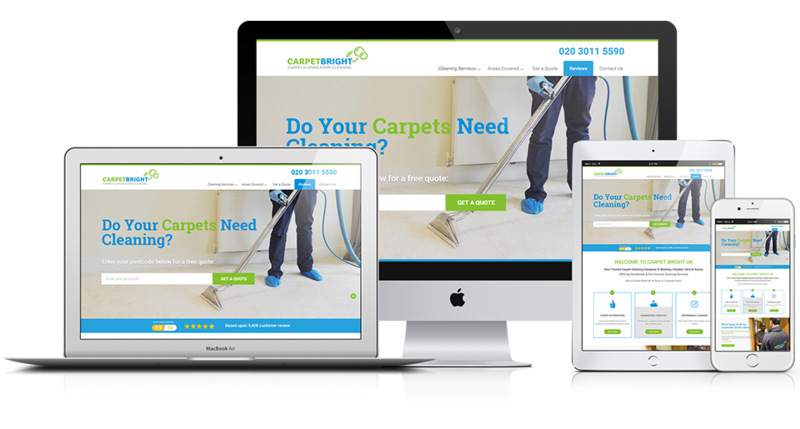 The initial research we conducted for Carpet Bright UK gave us a great understanding of competition in the domestic carpet cleaning industry, the marketing and SEO strategies that work well, and what we could do to get CBUK to the number 1 position in Google's search engine results pages. From our initial research and analysis we developed a keyword strategy. 1. The first was to analyse and investigate the "average monthly search volume" for keywords related to CBUK's services. We delved into the data through our specialist software and discovered which "keyword phrases" potential customers were using most often to find carpet cleaning companies. 2. The second factor we considered was the competition and the speed at which we could achieve Page 1 ranking positions for the most searched for keywords. Our research led us to selecting the local areas in the South East of England that would be most profitable for CBUK to target. Specifically these were low competition, high search volume local areas. After achieving strong Page 1 Google ranking positions for these keywords our strategy then switched to targeting higher competition keywords. After selecting the perfect keywords for the campaign, we then developed a plan to adjust the client's website code to reflect them. By doing so, we made the website more relevant to "carpet cleaning" keywords in the eye's of Google. This involved a detailed technical analysis of the client's website, which culminated in report of recommendations being presented to CBUK for their approval. "Off-page SEO" is the single most important aspect of any SEO campaign. In short, Today, in 2016, old-hat SEO techniques such as building large quantities of low quality links no longer help improve a website’s ranking position. Our link strategy for CBUK is based on the latest best practices in the industry and revolves around acquiring high quality backlinks that help improve a website’s Domain Authority, and thus its ability to rank in Google and other search engines. Due to local nature of this campaign, the creation of high quality citations and following our Local SEO best practice guidelines have proved invaluable in securing top ranking potions across dozens of locations. If you need your website to generate a large amount of enquiries, as you know, firstly it needs to be on Page 1 of Google. Secondly, your website needs to be designed in such a manner that it encourages visitors to get in contact with you. After successfully running a SEO campaign for 12 months we recommended a new website design. Although Google organic search traffic to the CBUK website had increased by over 100% and the amounts of lead generated increased from next to nothing to over 10 a day, we knew that if we developed a new design which incorporated Conversion Rate Optimisation best practices we could vastly enhance the effectiveness of the SEO campaign. We successfully relaunched the CBUK website earlier this year and since the site has almost doubled in the amount of leads generated on a daily basis. CBUK now receive 150 leads + per month like clock-work. Please view the table below for a small selection of the keyword results we have achieved for Carpet Bright UK. If you would like any more information please contact us or fill in the form below. "We have driven hundreds of thousands of 'wallet out, ready to buy' visitors to our client's websites. We'd love to see if we could do the same for you."